Lounge Has A Lake View! The spa with the best view! 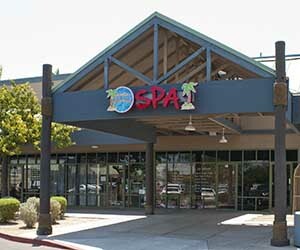 Opened in 2011, Hawaiian Experience Spa’s Chandler, Arizona day spa is our second location. All of our spas are privately owned by the Ibach family who founded the Hawaiian Experience Spa concept (read more about us) in 2007. Our Chandler, AZ location is over 2,400 square feet and with massage rooms, a facial room, couples’ massage rooms, two exotic showers (big enough for two in case you bring a partner), a beautiful lounge overlooking a lake, a complimentary tiki bar, and much more. Please feel free to stop in for a tour anytime! Aloha. #1 Day Spa In Chandler, AZ! Hours Starting: 9 am – 9 pm Seven Days A Week Directions: Take route 101 to the Ray Road Exit. Take Ray Road east until you reach Dobson (3rd light). Go through the light and make an immediate right turn into the parking lot.We are in the back of the center. The Chandler day spa is convenient to Gilbert, Mesa, Tempe, Phoenix, and other area cities. We have great career opportunities for experienced and entry level massage therapists in Chandler. Visit our Chandler Massage Career page for more information on working as a massage therapist in our Chandler day spa.
" “The un-matched quality of service and amazing skills of the variety of therapists and aestheticians is the reason I have been a satisfied member for nearly 3 years! Hawaiian Experience Spa is definitely the best in Chandler! Mahalo nui loa to Kaitlyn and Alyscia for spending much of their Sunday with me and providing a most relaxing finish to my week long vacation!” "
" “I have been a member for over 2 years now and I love it! The management always works hard to help me find a great massage therapist and the facials are amazing! " " “Thank you so much for a lovely experience. The massage was perfect and I really enjoyed getting to experience such a relaxing massage right next to my husband. We will definitely be back!” "